Cupcakes Take a look at our Signature Cupcakes! Custom Cakes Call us today to design a custom cake for your next event! Best. Buckeyes. Ever. Get prepped for your Saturday tailgating! Welcome to Sugarfuse! We're located inside Benson's Market & Catering in downtown Dover, OH. We have our award winning cupcakes available daily, along with other treats like Hand Made Buckeyes, Chocolate Covered Strawberries, Gourmet Caramel Apples (seasonal) & more. Currently, all of our cakes are made to order, so call, email or shoot us a Facebook message if you'd like to order a cake, or place a cupcake order (we often sell out!). So what's the Sugarfuse! difference? We're passionate about creating desserts that taste as good as they look, and look as good as they taste. Our creations, including our buttercream, are all made from scratch --- never with mixes. 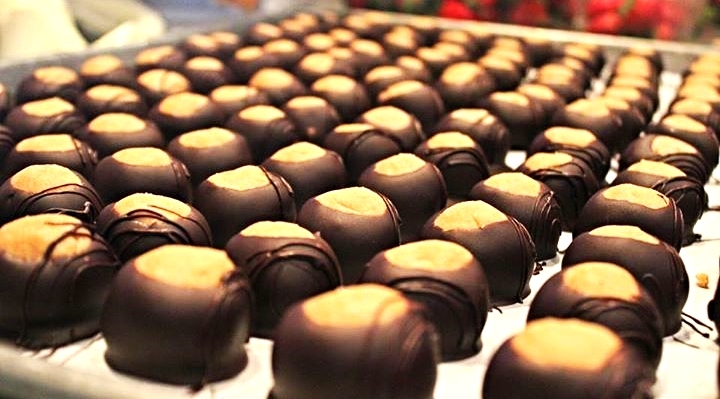 We use the highest-quality ingredients available and buy from local sources (like Eiler's Candy Shop!) whenever possible, and our never-frozen cakes reach you at the peak of freshness. Ever had a fondant covered cake? You probably didn't care for the fondant. We make our own, and we put lots of buttercream on the cake before we cover it with fondant. It's surprisingly common for bakeries to cut corners to save time and money during these steps. We'd rather put the time into making your cake perfect and have you coming back for more.